The Booster Vehicle (BV) is the booster component of the Ground-Based Interceptor (GBI). It provides thrust for the Exoatmospheric Kill Vehicle (EKV) to escape the atmosphere and engage ballistic missiles in space. The GBI is a silo-launched exoatmospheric missile that uses kinetic energy to intercept and destroy an ICBM in space at speeds exceeding 27,500 kph. 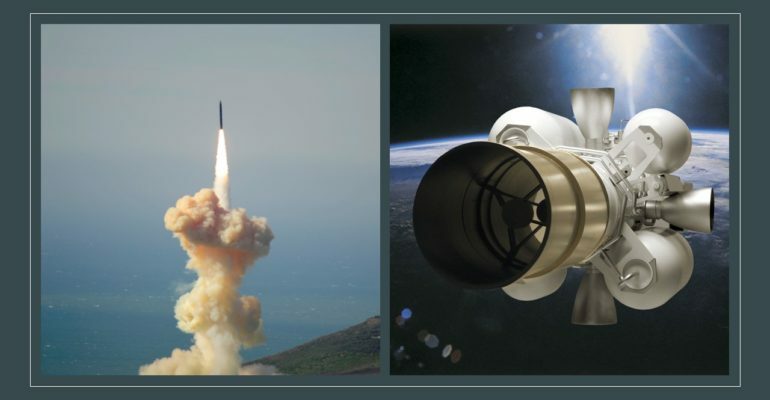 The initial design for the BV was produced by Boeing, which was named Lead Systems Integrator (LSI) of the Ground-Based Missile Defense (GMD) project in 1998, which was known then as the National Missile Defense program (NMD). The plan was to deploy the GBI by the year 2000, but the program experienced significant delays. To expedite the early testing of the EKV, a “surrogate booster” was used, made of surplus “Minuteman” missiles. The first BV, designated as the Commercial Off-The-Shelf (COTS) booster by Boeing, was first tested in 2001, and was not successful. Orbital ATK has been awarded contracts to develop an Orbital Boost Vehichle (OBV). Currently, the Configuration 3 Evolution BV is in testing phases with a target date for deployment in 2020. Configuration 1 (C1) Heritage The C1 Heritage BV is currently fielded within the GMD architecture and uses a three-stage booster. Its vehicle design and hardware components are based on legacy Space Launch Vehicles: the Pegasus, Taurus, and Minotaur. The C1 Heritage BV has proven successful in all test flights. Configuration 2 (C2) Design Upgrade The C2 Design Upgrade is also fielded and uses a three-stage booster. Improvements over the C1 Heritage BV include increased reliability, risk mitigation, and hardware improvements. The C2’s improved capability stems from avionics upgrades improving booster controllers, thrust vector controllers, batteries, and onboard flight software. The C2 also boasts enhanced protection against natural environments. Configuration 3 (C3) Evolution The C3 Evolution BV is still in the testing phases, but seeks to improve upon earlier BV models in a number of areas. Improved hardware components, increased protection against natural/hostile environments, and enhanced kill assessment enable the C3 Evolution to maintain improved reliability and mitigate risk. These improvements maximize the C3’s flexibility allowing for various basing options. An Exoatmospheric Kill Vehicle (EKV) is the interceptor component of the U.S. Ground-based Midcourse Defense (GMD) and is launched via a Ground Based Interceptor (GBI) missile. In the late 1990’s Raytheon, among two other competitors, was awarded the DoD contract to develop Exoatmospheric Kill Vehicles. The early stages of EKV evolution had mixed results which was partially due to inadequate funding and lack of confidence in the first 2 generations (the CE-I and CE-II) of EKVs produced. The most recent EKV, the Capability Enhancement-II Block 1 (CE-II Block 1) features various improvements and modifications to the previous generations and consequently, improves the chances of intercept by the EKV. Future generations of EKV’s include the Redesigned Kill Vehicle (RKV) which improves cost, maintainability, and reliability as well as features a modular design. Raytheon is also developing a Multi-Object Kill Vehicle (MOKV) which can intercept several objects in space. The MOKV is currently in its design phase. Capability Enhancement-I (CE-I) Generally poor designs hindered the first generation of EKVs due to rushed deployment. The CE-I was deployed in 2004 in order to meet the presidential directive that required fielding an “initial capability for a system to defend the United States within two years.” Despite this, the first test of the CE-I did not take place until 2005, after it had already been fielded. In total about 20 interceptors were equipped with the CE-I model. The hardware in the IMU (Inertial Measurement Unit) was relatively poor which consequently led to the multiple test failures in the beginning. During a 2013 test, the CE-I system failed due to a “battery related problem” which resulted in the kill vehicle being unable to separate from its booster. The initial failures of the CE-I variant EKV showed that increased oversight into the development of the EKV was critical and that the failures created an opportunity for criticism from opponents of missile defense who believed that the US government should not spend money on it. Capability Enhancement-II (CE-II) In 2005, the Bush administration was aware that the CE-I had multiple issues and was becoming obsolete. Thus, the administration began development on the CE-II, the second generation of EKVs. Again, the US military began fielding the CE-II variant, before it had undergone any testing in 2008. In 2010, two intercept tests were conducted using the CE-II variant EKV; both tests failed. The first failure was attributed to a quality control problem during construction, while the second was attributed to a design flaw in the guidance system. As a result of the two failures, the director of the Missile Defense Agency halted the fielding of the CE-II variant until there was a successful test. A successful non-intercept test in 2013 showed that the issues in the CE-II variant had been corrected despite the CE-II being far from perfect. With the flaws having been corrected, the successful test again shows the need for increased oversight and for there to be clear and realistic goals that will facilitate successful tests of the EKVs. Capability Enhancement-II Block 1 (CE-II Block 1) The CE-II Block 1 corrects many of the issues seen in the previous generations of EKVs which greatly increases the reliability of the CE-II Block 1. Unlike the previous generations, the CE-II Block 1 was not fielded before it was tested. This fact alone silences one of the main critiques of the previous generation, which was that the Pentagon was wasting its money by fielding the EKVs before they were tested and proven to be effective. The advent of the CE-II Block 1 comes at a time of great need. North Korean missile tests have increased and become more successful in recent years. The CE-II Block 1’s first and successful test intercept of a simulated ICBM shows that not only have many of the mistakes of the previous generations been fixed, but it also sends a clear message to potential adversaries such as North Korea that the United States now has the capability to repel a limited ICBM attack. The success of the first test of the CE-II Block 1 give the Pentagon greater confidence in GMD moving forward.